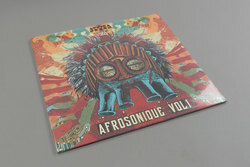 Various Artists - Afrosonique, Vol. 1. Vinyl LP. Bleep. Afro Seven continue on a roll following up their Manu Dibango and Pasteur Lappe reissues with this compilation of gems from the 70s and 80s. BUT… the aforementioned gems have been reworked by current day producers in order to inject some new life into them. It’s quite a departure from the stellar work the label have done so far, but don’t let that put you off. Tony Thorpe enlists the talents of a strong crew of musicians including Silkie, IG Culture, Plaid and John Talabot, all bringing their own voice to classic tracks from the Africa Seven archives. Check the Pasteur Lappe remix!